When you have children that need to burn some energy when the weather isn’t great, this rec centre is a great place to come. 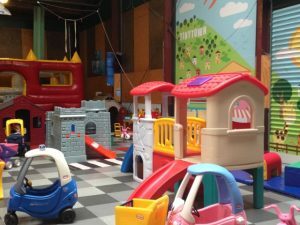 For toddlers and those 4 years and under, there’s Tinytown which is a fenced and gated area with a bouncy castle, ride ons and a range of Little Tike playhouses and equipment. For older kids, there’s the 20m x 40m concrete rink area for scooters, skateboards and roller skates and blades. You can hire these last 2 (smallest size skates are 9 and smallest size roller blades are 13) and borrow bike helmets, knee, elbow and wrist guards. Smaller kids can also use balance bikes otherwise bikes aren’t allowed. There are ramps and plenty of space, although it can get busy especially on particularly wet days! Within the rink there are basket ball hoops and an area for playing indoor hockey with hockey sticks, pucks and balls all available to borrow. With all of this going on in the one area, it can get quite chaotic but kids seem to manage to miss colliding most of the time! You know your children’s abilities, so you’ll know how much supervision and help they’ll need. It’s a great place to join in and burn some energy for the whole family though! TOP TIP: there’s no cafe onsite and nowhere really close to buy food or drinks (although there is a water fountain at the recreation centre). Take your own food and drink – just make sure you’re not eating or drinking on the rink! Address: 101 Kilbirnie Crescent, Wellington. Free carpark onsite and parking on the main road is also an option. Open: Tinytown Monday 10.15 – 4pm Tuesday & Wednesday 9am – 3pm, Thursday 10.15am – 4pm, Friday 9am – 4pm and Saturday 9am – 12pm. Closed Saturday afternoon and Sunday for birthday party hire. Rink daily 9am – 10pm (weekdays) and 9pm (weekends). Closed public holidays. TOP TIP Check here or the Facebook page before you go to see if the rink is open for public or family sessions as it closes for tournaments. Price: Tinytown for kids aged 4 years and under $4.50. For the rink area take your own wheels and pay Adults $5, Kids (up to 15 years) $3.50. Spectators and adult helpers are FREE. Rink + skate hire Adults $8.50 Kids $7.